The task was relatively banal: the construction of a departure hall for touring coaches. But the more one looks, the more Knapkiewicz & Fickert’s structure becomes an intriguing adventure. The new Swiss terminal, which is trapezoid in plan and around 33 to 56 metres along the sides, has space for two coaches one behind the other and six, side by side. A folded roof spans both coach and passenger areas. Its irregularly shaped, steel-ribbed underside is clad with green PVC-sheeting printed with a map of Europe. 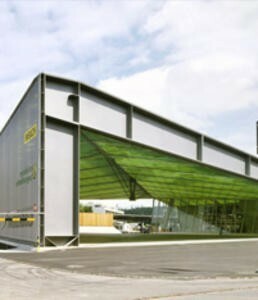 On the outside the roof is clad in green-and-yellow striped corrugated plastic. The details reveal the architects’ pleasure in disrupting clarity and generating contradictions. For instance, the otherwise concealed steel construction is exposed on the side faces. On each side, an exposed beam up to 3 metres high joins the main support at its far end at an acute angle that resists bending.